Christian Loclair investigated interactive dance and media scenarios. As a solo battle dancer he became the winner of the „International Battle of the year 2007“, the Ruhrpott Battle 2007 and the Wutal Battle in 2008 (Pina Bausch Festival) to name only a few. In 2007 and 2010 he was chosen to represent Germany at the UK Bboy World championship. Christian is also known as a contemporary theatre choreographer and media-engineer. His work is mainly focused on combining media technologies and performative art. He choreographed the dance piece marionettes (2006), reflection (2007) and co-choreographed 110(2008) and Pow_2045(2014). He studied Computer Science at the University Potsdam, specializing in Media Engineering (Prof. Dr. Klaus Rebensburg) and Human Computer Interaction (Prof. Dr. Patrick Baudisch). Since 2012 he was able to collaborate with onformative, a studio for generative design melting art, science and interactive media. 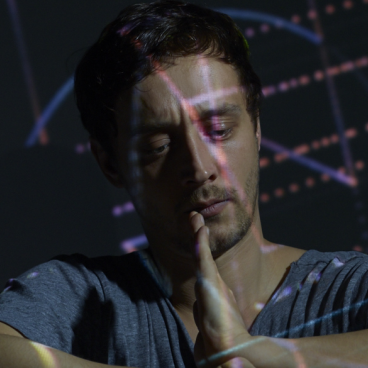 In collaboration with onformative he implemented the experimental tool pathfinder, to investigate generative concepts within the field of choreography.